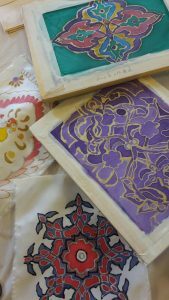 A new project commissioned by Community Learning and Development North Lanarkshire is well underway. 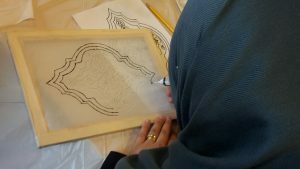 Artistic Director Bryony Murray and Artist Gayle Robinson are working with some members of Coatbridge?s new Syrian Community who are forming new lives in Coatbridge having left their war torn homeland. 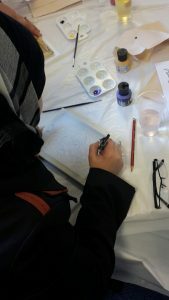 The group who are all from different areas of Syria, are taking part in a series of 8 therapeutic workshops which are looking at connections between Scottish & Syrian culture though design and architecture.? 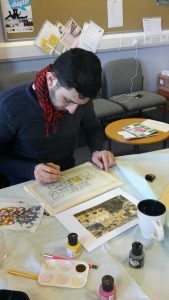 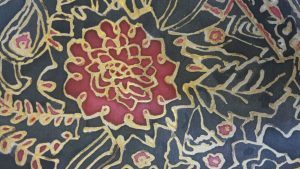 ?Using a combination of watercolour and silk painting, the group have been creating artwork inspired by decorative details and patterns found in architecture and textile designs from the two countries which bear great similarities, such as Paisley pattern and traditional Syrian geometric floral patterns. 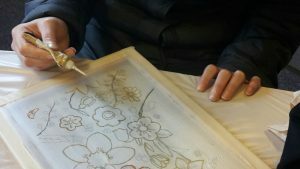 The project provides a safe, welcoming place for the participants to come together, meet new people and to develop their spoken English through sharing stories and learning new skills. 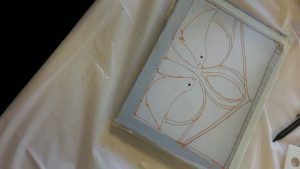 ?The project will culminate with an exhibition of their work which will be shared with the Coatbridge community.